The resonant original musical Bandstand dances a delicate line between nostalgia and disillusion. 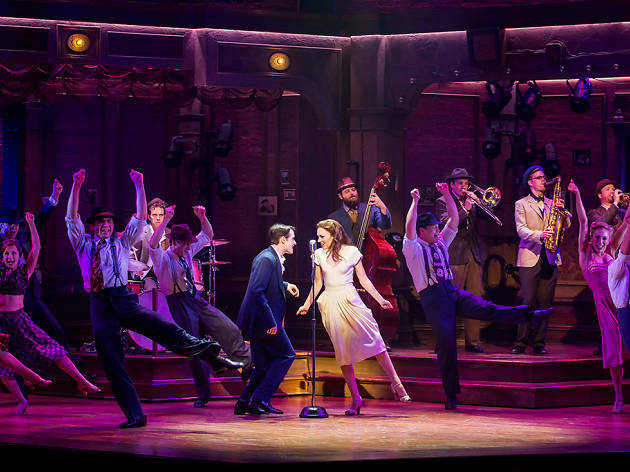 What it seems to promise, and often delivers, is Broadway escapism: a tale of soldiers returning from World War II into a lively world of big-band music, boogie-woogie dancing and a booming American economy. Donny (the very engaging Corey Cott) assembles a music combo composed entirely of fellow veterans, hoping to win a competition in New York and earn a shot at Hollywood. Sounds like a happy old movie, right? But these soldiers, we soon learn, have trouble getting into the swing of things. Try though they may—through work, repression, copious drinking—they can’t shake off the horror of war. Director-choreographer Andy Blankenbuehler (Hamilton) doesn’t stint on period vitality; the terrific group dance numbers, including an Act I showstopper called “You Deserve It,” burst with snazzy individuality. But Bandstand’s heart is in its shadows—the entertainers often share the stage with ghosts of lost comrades—and in the persistence of its efforts to shed light on them. That happens, most of all, through music. 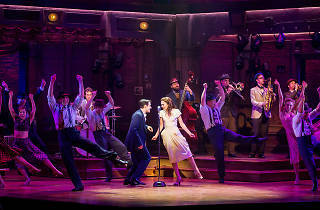 The actors in Donny’s motley band—Brandon J. Ellis, Alex Bender, Geoff Packard, Joe Carroll and James Nathan Hopkins—play their instruments live (and extremely well), fronted ably by Laura Osnes as singer-lyricist Julia, the widow of Donny’s closest buddy in the Pacific. (Beth Leavel adds welcome comic support as her mother.) As the stakes rise, Bandstand’s score, by Richard Oberacker and Rob Taylor, moves from pleasurable pastiche, including a zippy novelty ditty about Cleveland, to a climax whose impassioned call for attention to the plight of veterans recalls the socially engaged lyrics of E.Y. Harburg. The show defies you not to be moved by its valiant band of brothers. Bernard B. Jacobs Theatre (Broadway). Music by Richard Oberacker. Book and lyrics by Rob Taylor and Oberacker. Directed by Andy Blankenbuehler. With Corey Cott, Laura Osnes. Running time: 2hrs 35mins. One intermission. This musical was a bit darker than I expected but in a good way. It pays homage to war veterans and their struggles in a way that is touching and relatable. While I wasn't running home to re-listen the soundtrack, that female lead really holds the show. Her voice is incredible and any scene where she sings is basically a winner. It's a great and important story to be telling. Even better that it's on such a huge platform to touch large audiences.